Jamie Barter has shared a few more photo from his early photo collection with us. 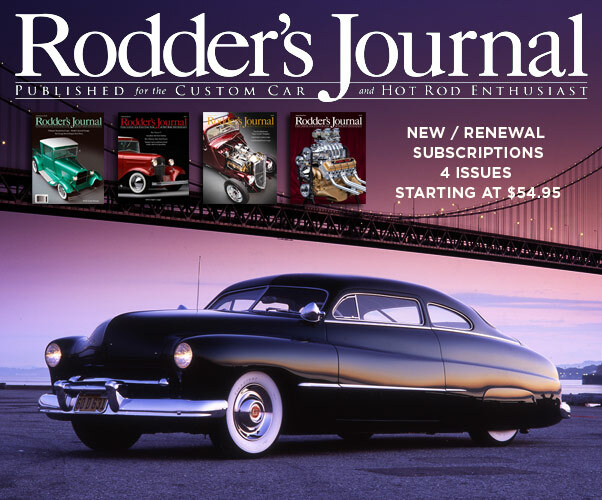 This time he shared 3 photos of a heavily restyled 1936 Ford Cabriolet taken around 1948. Jamie found these three photos at an recent (autumn 2017) eBay auction. 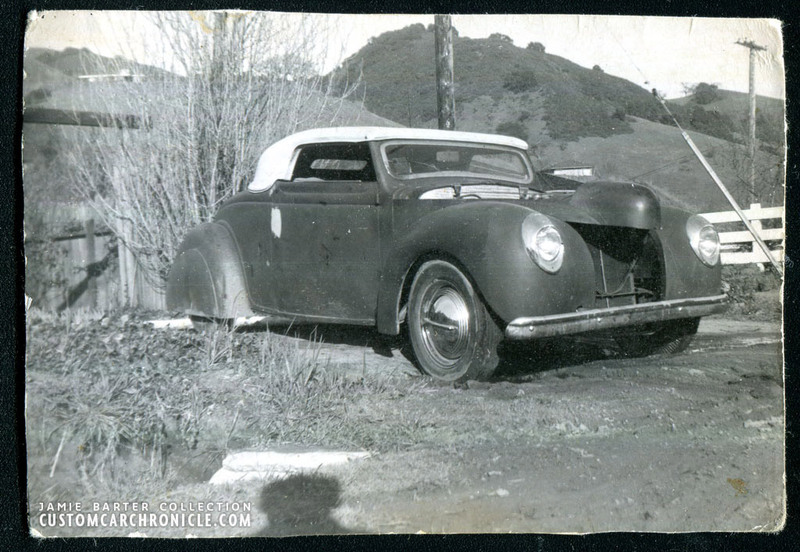 The three photos all appear to have been taken in the later part of the 1940’s The license plate tag on the car is from 1948 or 1949. The only information that came with these three photos was that the photos were probably taken near San Jose, Gilroy, Salinas area. No other information was given by the ebay seller. 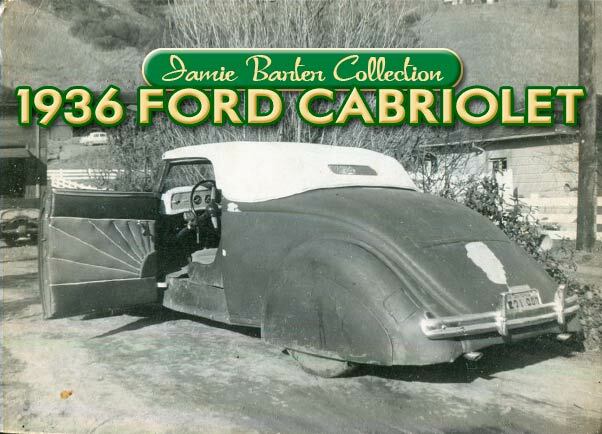 So far Jamie, nor anybody else who has seen these photos has been able to identify the ’36 Ford Cabriolet in these photos. It appears that the photos have been carried with the owner in his wallet for many years, looks like he was very fond on the car. If you know anything about this ’36 Ford, please email Rik Hoving so that we can share the information here. 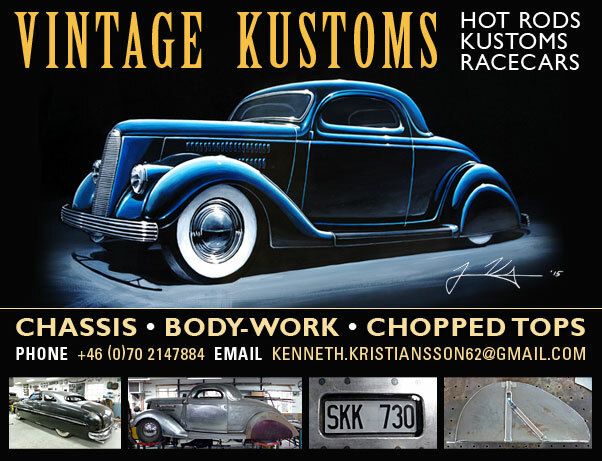 The car in the photos is a ’36 Ford that has been channeled over its frame and to witch ’40 Ford front fenders and heavily sectioned hood have been added. The running boards have been removed after the body was dropped over the frame to make the bottom of the body sit near level with the bottom of the fenders. The windshield frame has been cut down at least 3-4 inches, and a padded top was created to fit the new lower windshield. The sectioned 1940 Ford hood had its top portion cut out to create a new hood opening. The hood sides were modified to fit with the ’36 Ford cowl. The door and trunk handles have been removed, and a custom gas filler door,possibly taken from a newer car, has been added to the drivers side rear fender. 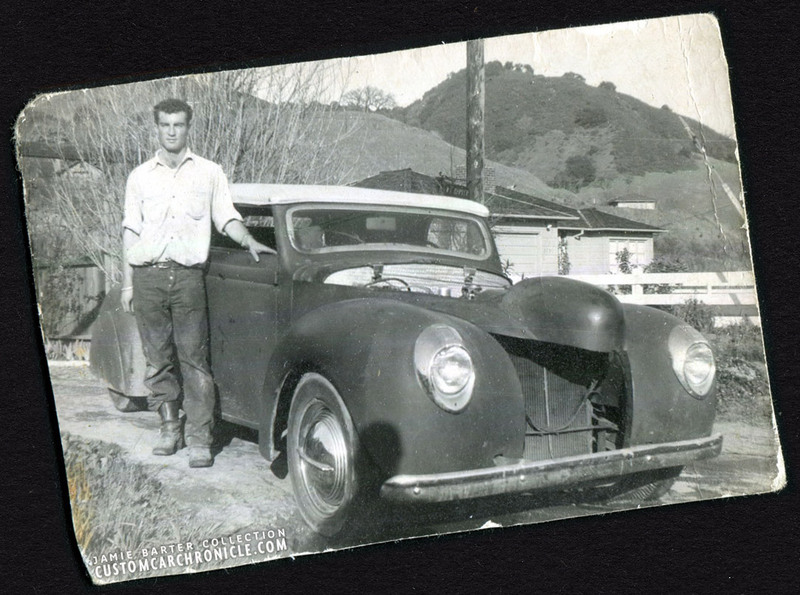 Possible the owner/builder posing with his ’36 Ford with ’40 Ford front fenders and hood. It looks like the firewall was fitted with a an engine turned panel. It appears that the car is still under construction. 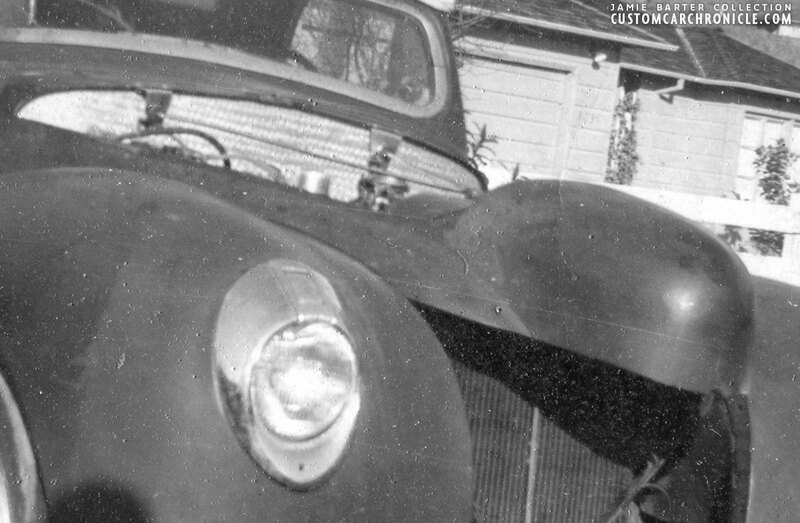 Looking at these photos I think that the flat front bumper (brand unknown) is too close to the body to make it possible to install a ’40 Ford grille in the opening. Perhaps the owner was still trying to figure out what to do for a grille. Also interesting to see is that the front bumper mounts have been lowered, after the channeling, to fit the stock holes in the 1940 Ford front fenders. While at the back the mounts seam to have been left in the stock position on the frame, which made it necessary to cut larger holes into the body and mount the rear bumper – a 1941 Ford unit – higher on the body compared to a stock ’36 Ford rear bumper position. A set of black wall tires are used, an indication that the car might have been created during or shortly after WWII when white wall tires were impossible to get. A set of single bar flipper hubcaps and beauty rings are used to dress up the wheel. With the raised ’40 Ford front fenders, sectioned hood and heavy chopped windshield the car has become very low in overall height. Hard to tell the brand and year of the front bumper, but it looks to have been flattened to fit the Ford bumper mounts. Another interesting detail is the “sunrise” interior door panel upholstery. A typical Art-Deco feature seen in some coachbuilt cars. It appears that the dashboard was home made and upholstered with a flat panel with gauges added set into it. The steering wheel is a 1940 Ford unit. The rear quarter photo were we can see the car with the door open shows how much the body was dropped over the frame. It also shows that the panel created to cover the frame has a lot of road debris on it. 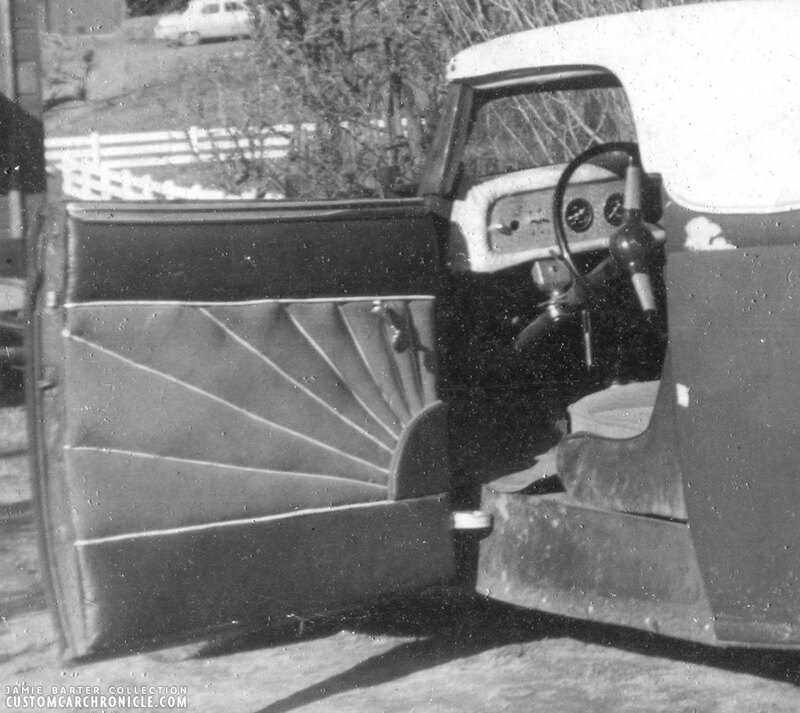 Once the running boards were removed the road dust and rain from the road would find its way into the interior between the frame cover and the upholstery panel on the door. It reminds me about a story Bob Drake told me about his road trips in the Jack Stewart Ford. That custom had the same situation, it was also channeled and door upholstery clamped against the frame cover was not enough to keep water from the road coming into the interior when he drove the car in wet conditions. He always carried several towels in the car which he would stuff in between the door and floor of the car to prevent the interior getting all wet and dirty. It sure looks like this ’36 Ford had a similar issue going. The sunrise upholstery pattern give a very classic feel to this ’36 Ford Custom. The gas filler door and other body modifications indicate that the owner either was very handy and creative, or was able to spend some money on his dream car to have it built by a body shop. Close up show the engine turned fire wall panel. Close up of the sunrise door-panel upholstery, the padded dash with custom insert, and ’40 Ford steering wheel. 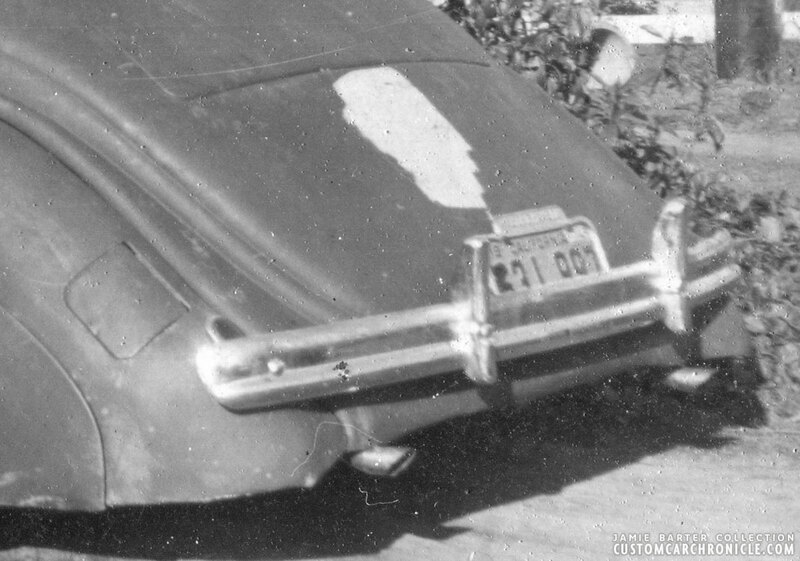 Close up of the rear shows the custom gas filler in the rear fender, the 39 or perhaps 41 Ford taillights sitting very low on the fender and what appears to be a ’49 license plate tag. I wonder if this ’36 Ford was ever finished with a nice gloss paint job, a new grille and possibly new front fender to clear the grille. There are pictures around from several ’36 Ford’s with ’40 Ford front ends grafted on, which was a common restyling method back in the 1940’s, but none looks to be similar to this one. 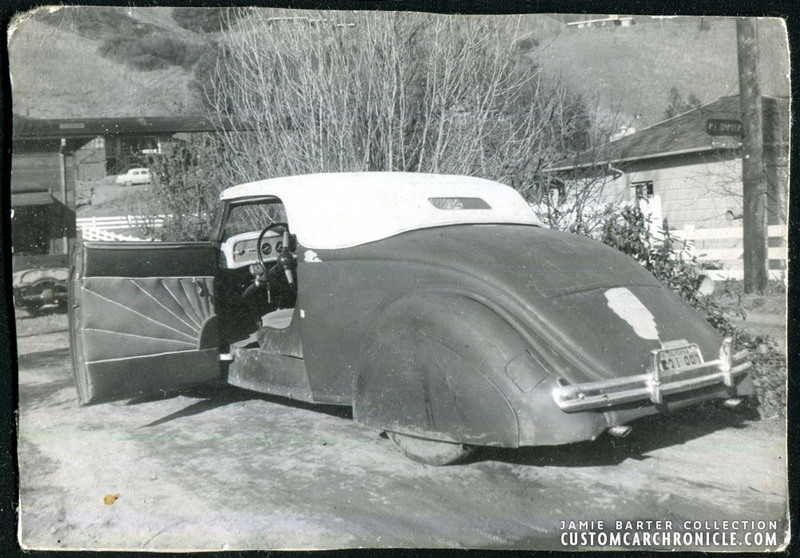 Perhaps one of our readers will recognise this car, or perhaps the guy in the picture and shed some more light on this mystery Custom ’36 Ford. 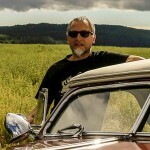 Thank you Jamie to share these great Custom Car snapshots with us. I love this car! The in-progress look is intoxicating to me – just as the cars looked around my home when I was still too young to drive. (Kinda wish I had seen this upholstery before I had mine done..)! These old back-yard pics are the greatest! Thanks all!